REDmoney Group’s latest offering, IFN Seminars, takes Islamic finance to new and developing markets and tackles the industry’s most innovative and imperative topics. These high-level, practitioner-led events offer practical insights on technical and strategic aspects of Islamic finance to dealmakers, regulators and intermediaries in core and developing Shariah-compliant markets. Leveraging on our highly regarded Forums and Training courses, these seminars offer the same exceptional quality of speakers in a small-group setting allowing delegates the opportunity to interact with our panel of highly experienced industry leaders in an event format that is intended to provide comprehensive knowledge on the very latest issues and trends. 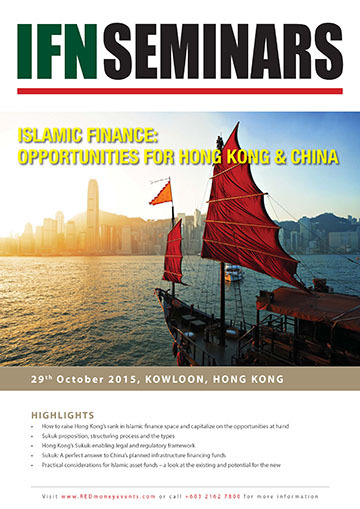 Why Islamic Finance and why Hong Kong? Hong Kong is one of the world’s fastest-growing major economies with an average annualized growth rate of 10% over the last three decades. For generations the territory has been viewed as an important gateway into the People’s Republic of China (PRC), and in more recent times, for Islamic finance. Significantly, changes to legislation have allowed for the issuance of Hong Kong’s first sovereign Sukuk - US$1billion issuance in 2014 - which created an important international benchmark. Hong Kong recently announced its second sovereign Sukuk, thereby demonstrating significant governmental support to Islamic finance industry in Greater China. Given the determination of the Hong Kong’s government towards the inaugural and subsequent Sukuk issue, the potential of the People’s Republic of China’s population and the blossoming relationship between PRC and the developing Islamic financial markets, this REDmoney Seminar comes at an opportune time. Should you be involved in capital raising in Hong Kong, whether from the viewpoint of an issuer, regulator, consultant, book runner or arranger then this one day seminar has something for you. Use this opportunity to assess the potential and growth of Islamic finance in one of the fastest growing economies in the world, and understand the key issues inherent to the structure and use of Islamic finance products in China and beyond.